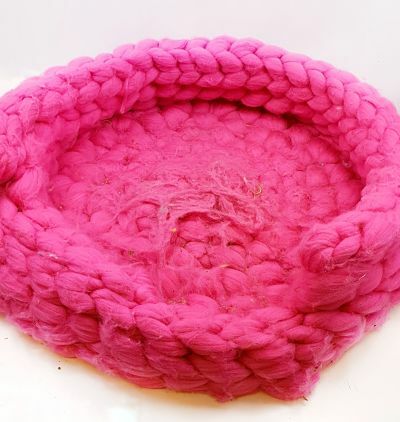 How to look after or revive a Mammoth Chunky yarn dog basket. I thought I would show how, a Mammoth giant yarn dog basket, looks after 8 months use by a puppy, and how to revive it. So this basket in bright pink, was made for Alice 8 months ago. It was hand crochet and used approx 1.5 kg of yarn. She loves it! Alice has always loved a chin rest and this works perfectly for her with the chunky soft sides. Alice was about 8 months old here. She is a Westipoo, her mother is a West Highland Terrier and her father is a toy Poodle. And she has problem hair!! The fact that Alice loves her bed, made it difficult to take it away from her to put in the washing machine, but I finally did a couple of weeks ago. Normally I just take it outside and give it a good shake, and vacuum without actually touching it! Below is a ‘before’ picture. You can see it needs a good trim and a wash. This is 8 months of puppy love. So firsty I pulled any pilled or loose fibres with my fingers. The picture below shows that I was quite rough pulling at any strands and gathering them ready to cut. The next stage was to cut all the fibres i had gathered together and cut these off. I then snipped off any others I had missed, and generally snipped around. Be careful not to cut into the bulk of the big stitches. This bed was pretty bad and I spent around 20 minutes doing this. The picture below shows what it looked like before I put it in the washing machine. Rather than continuing to cut of bits of yarn that was already loose, i put it into the washing machine at this stage. I used a gentle cycle, so 30 to 40 degrees, and minimal agitation. I also set the washing machine to a short spin. I put average branded washing powder in the machine and some of the smell releasing balls. I didn’t use any fabric conditioner. When the wash cycle had finished, I just left the basket next to the central heating boiler. It was dry in under 2 hours. The basket looked very good, but just needed approx 5 more minutes of trimming, quite possible the bits I thought the washing machine would remove as I thought they were already loose. The finished article in the pictures below. It looks a trillion times better! In future I will do this more often so I only have to spend a couple of minutes trimming. You can do this many times, the yarn is so chunky and thick , it wont alter its function or appearance. If you have a Mammoth chunky knit blanket, you can use the same method as with the basket. But remember the more it is used the more you will need to do this to keep it looking good. If you have a merino blanket, whether it has been lightly felted or not, it will still pill and shed. You can trim merino, but do not put it in the washing machine unless you want a fully felted blanket! And please also note the basket can be used as a cat basket. 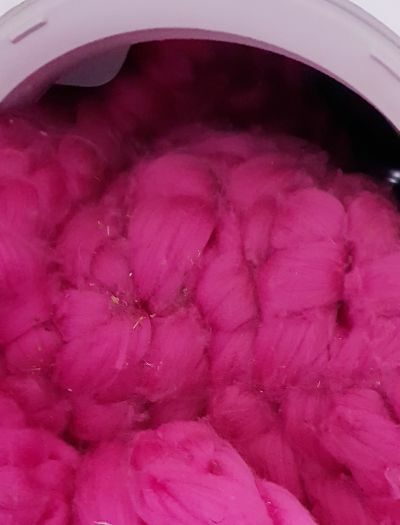 If you would like to purchase the yarn, please follow the links If you want more than 1 kg but less than 4 kg, order multiples of 1 kg. We will send one large ball. 4 kg is a separate listing as is a better value purchase, than multiples of 1 kg. Even better value is our 10 kg bale.